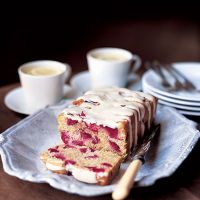 Plums are only in season until late September - so make the most of them with this moist, buttery and very moreish loaf cake. If you use oats rather than oatmeal, the texture will be more coarse, but will taste just as delicious. Preheat the oven to 170°C, gas mark 3. Grease a 450g loaf tin and line with non-stick baking parchment, making sure that the paper comes at least 1cm above the rim of the tin. Halve and stone the plums and cut into chunky slices. Using an electric whisk, beat together the butter, orange zest and sugar in a large bowl until very pale and creamy. Gradually add the egg, mixing well after each addition, and sprinkle in a tablespoon of the flour with the last of the egg. Sift the remaining flour and the baking powder into the bowl, add the oatmeal or oats and gently stir in with a wooden spoon. Stir in two-thirds of the plums and tip the mixture into the loaf tin, spreading it level with the back of a spoon. Scatter the remaining plums over the surface. Bake for about 1 hour or until the surface feels firm to the touch and a skewer inserted into the centre comes out clean. Leave in the tin for 20 minutes then transfer to a wire rack to cool a little. Beat together the icing sugar and enough orange juice to make a smooth paste that just holds its shape. Drizzle the icing over the top of the cake and leave to cool completely. This recipe was first published on Waitrose.com in September 2005.